"Through effective partnership working and information sharing with statutory and voluntary agencies, we will raise awareness of the risks to vulnerable victims of fraud and ensure effective preventative support is in place to address this." We will explore ways of raising awareness of what the most current risks are, as well as looking at support mechanisms that are in place for vulnerable victims, drawing on and developing links with statutory and voluntary services. Continued development of a network of statutory and voluntary sector agencies which have a role to play in tackling vulnerable and elderly victims of fraud and rogue trading, to include improved information and communication flows between the different agencies. Identify what training exists for frontline staff and other partners to ensure people are aware of what the signs are to look for, and look to develop this further if necessary. 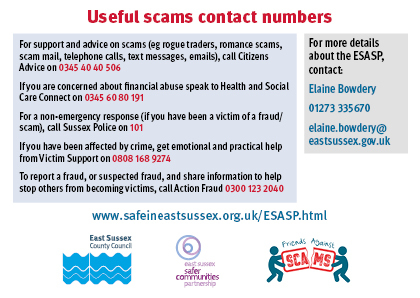 The East Sussex Against Scams Partnership (ESASP) is a county-wide partnership committed to helping protect residents against scams through raising awareness about the different types of scams. It is a partnership of organisations - businesses, charities, clubs, community enterprises, councils, societies, voluntary groups and other partners - committed to taking a stand against scams with the aim of making East Sussex a scam-free county.